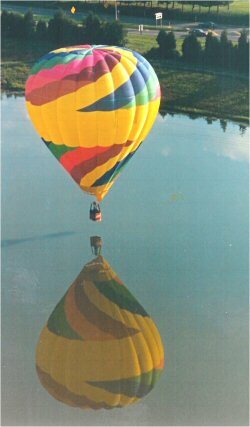 If you are in the area come visit our balloon-port and be entertained by over thirty years of ballooning history. We have over one hundred and fifty 8x10 color photographs of special shaped balloons from around the word, to include Mickey Mouse, the Disney Castle, the Space Shuttle and much more. In addition we have numerous balloon posters and artwork, as well as a balloon basket manufactured in 1980 that has been converted into a bar table that we use for our First Flight Ceremonies. You will also be amazed at the pictures and a video tape from the largest balloon festival in the world, The Albuquerque International Balloon Fiesta. Over seven hundred and fifty balloons are launched at this festival each day for ten days during the first full week of October. Visit their web site for more exciting information on the 2005 Fiesta. Please call first to confirm our schedule. FROM THE NORTH: Travel I-95 South and take exit 86A – East (Atlee). Follow your exit road to the stoplight (there is a Sheetz Gas Station on your left). Turn left at the stop light onto Leadbetter Road. Once on Leadbetter Road take your first right onto Richardson Road (just prior to the fire station). At the end of Richardson Road turn right onto Lickinghole Road. Our address is 9988, #8 Lickinghole Road (The Atlee Building) and it is the fourth building on the left side of the road. FROM THE SOUTH: Travel I-95 north and take exit 86A – East (Atlee). Follow your exit road to the stoplight (there is a Sheetz Gas Station on your left). Turn left at the stop light onto Leadbetter Road. Once on Leadbetter Road take your first right onto Richardson Road (just prior to the fire station). At the end of Richardson Road turn right onto Lickinghole Road. Our address is 9988 Lickinghole Road, #8 (The Atlee Building) and it is the fourth building on the left side of the road. FROM THE EAST OR WEST: Take your best route to I-95 north and take exit 86A – East (Atlee). Follow your exit road to the stoplight (there is a Sheetz Gas Station on your left). Turn left at the stop light onto Leadbetter Road. Once on Leadbetter Road take your first right onto Richardson Road (just prior to the fire station). At the end of Richardson Road turn right onto Lickinghole Road. Our address is 9988, #8 Lickinghole Road (The Atlee Building) and it is the fourth building on the left side of the road.